Manoj Seonath, IDC Head: Agro-Processing; Thabang Masiu, Sir Juice Quality Manager; James Wood, Aptean Director: Business Development; Muhammed Naasif Darsot, Director: Dursot Foods. 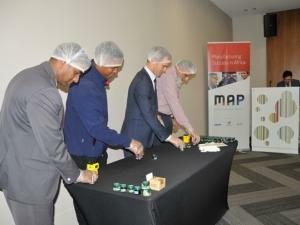 The workshops held on 11 and 13 September in Johannesburg and Cape Town respectively were arranged to discuss the South African Excellence Movement (SAEM), and how this initiative will equip the South African food manufacturing industry with tools to assist them operate more efficiently and avoid food safety scandals going forward. "The ability to boost your competitive advantage as a food manufacturer is critical for survival," said Ian Huntly, Co-Founder of the SAEM. The recent Listeriosis outbreak, along with several international food scandals, have highlighted the need for a more in-depth look at our processes and efficiency levels. The exorbitant cost of recalls, along with possibly detrimental reputational damages, are a very real threat facing all food manufacturers today. Along with quality concerns, competitive pricing and pressures to get product to market on time, business owners are faced with the inability (in general) to quickly recover expensive stock batches in the event of unexpectedly interrupted production lines. James Wood, International ERP Manager of Aptean, asked Executive Level management delegates if they knew where their processes in the factory were inefficient, and whether they were aware of whether their expectations from a business point of view were being met in the factory. "The problem more often than not lies in the lack of visibility from the boardroom. It's a question of being able to make decisions that positively impact the bottom line immediately, not identify the causes in hindsight," said Wood. "Running a modern manufacturing business without fit-for-purpose manufacturing operations management systems is no longer a viable option. The first step to transition into an automated and digitised work environment is knowing exactly what information you need to have at your fingertips on a day-to-day basis to effectively manage your organisation and improve profit." Being able to see exactly what the impact of stoppages are on your bottom line, as well as the impact on quality management and regulatory transgressions, enables you to take corrective action immediately, saving substantial amounts of money. The money comes from avoiding penalties, as well as from preventing stock losses. Most food manufacturers are under the impression (using paper-based systems) that their overall equipment effectiveness (OEE), if measured at all, is running at between 60% and 85%. When accurately measured, they are astounded to find that, in fact, the impact of stoppages results in the OEE measurement being closer to between 35% and 50%. The negative impact on profit often goes unmeasured and therefore uncontrolled. Microsoft Manufacturing Development Director, Ravi Bhat, agreed, stating: "The industry perspective on Industry 4.0 and cloud offerings is typically one of scepticism, being handed over to the IT department to examine and implement. However, this is a business decision, and one best left to the managing directors to decide on based on the needs of the business." Workarounds cost businesses excessive investment in time and money, and result in reduced productivity and low morale. Implementing a fit-for-purpose enterprise resource planning (ERP) system provides the best ROIs, are scalable and can be installed within six months, showing increased profit levels within six months. An additional benefit is user-friendly interfaces, resulting in better data-capture and seamless flow of data transfer. Top-level executive managers were given the opportunity to see first-hand how equipment stoppages on the shop floor can be captured in real-time, driving operators to make informed decisions based on actionable intelligence, and impact the next hour of production when simulating a fruit jam production line. This has a direct impact on the business bottom line and helps drive greater productivity and profitability. The impact of sensible manufacturing implementation decision-making can be a make or break one.